Thank you Lynx, Tracis, GPFun, and Willie. Vins has defiantly been full of ideas and persistent in spending time to making things. He still surprises me on how much he remembers and can do, such as what he has presented as finished! Clicking either picture will take you to his web page. I thought it was a bit much, but after 3 weeks, Vins completed it! And now the blanket is up for auction on the site. He's pretty excited about it this year and is planning on saving the money he earns this year from all the things he made. I am so sorry, I can not find the e-mailed of who asked about larger pillows by Vins, the Star Wars pillows are now posted as well. Vin did an excellent job, he is so talented. Must of got that from his very talented Mom! Thank you D, and Vins said to say thank you as well. I think he'll deny where he gets it from though *wink* you know how pre-teens can be. Wow, postal people must of been working overtime! You are very welcome, and Thank You! 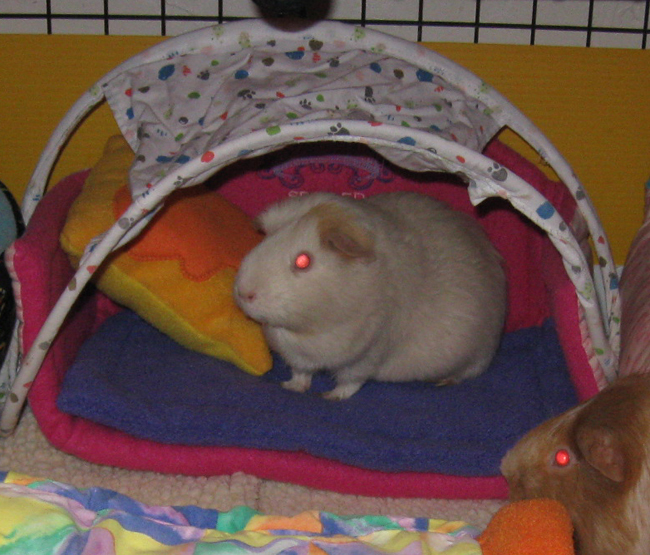 I hope the piggies figure them out quick, they'll be a cool spot to lay at. New Guinea Mom - it completely slipped right by me to mention about fabrics available. With how many different things I offer, size differences and such, I do not always get to post all the fabrics available to make items. But to get to see them, all one has to do is ask. All I need to know is what you'd like made, how many, and thoughts you had for colors/themes, or just a simple boy/girl for a general. It's true, I did take down my materials page, due to the amount of times I had to say I did not have enough to make "X" amount of items with fabrics. I will try and get another page back up again in the future. Another item I've only made by request for the past several years has also been introduced into our product line is Grid Covers. Hay Hammocks are loose woven stripes of fabric that all size piggies can enjoy together; with less worries of bodies, heads, or legs getting caught or stuck in more traditional hay racks and bent grids. Each fabric piece is free to move along its weave, making it easy for any size piggie; new born or adult, to easily pull pieces of hay out. You determine the height by moving easy to use attaching clips along the cage sides. 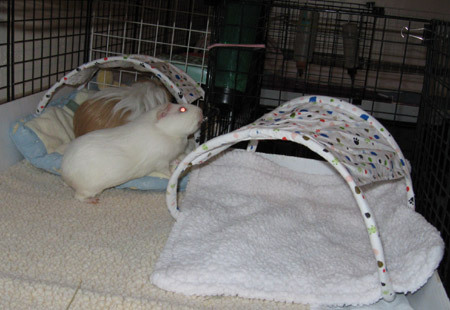 Hay Hammocks can also be attached to lay flat against one side of the cage or extend the top to make a "V" and then filled with hay. 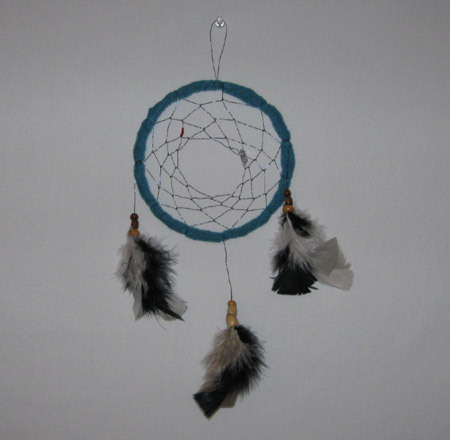 Introductory pricing on Hay Hammocks is $11.99 for full size shown above. Some fabric selections are listed on the page. You can also request colors or themes. Canopy's have gotten a slight adjustment to them and can now be used with any pre-existing beds or pads if you do not wish to purchase a new bed or pad. Canopy switched for another, which excited the piggies a bit. Canopy's are now sold separately, so you can change things up a bit. Purchase a matching bed or pad with your canopy and receive a dollar off. Ideal for those that like to flip their cozy cup beds to get a 'roof' over them. 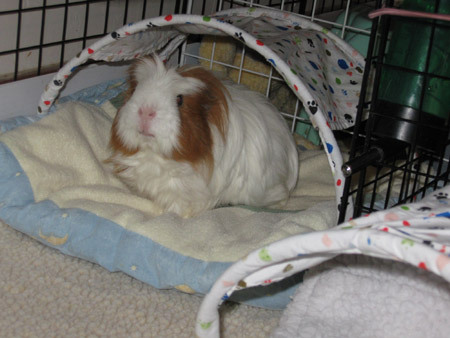 I love the hay hammock idea! The perfect solution to those who worry about their piggies getting stuck, which would be me if I had that kind of holder. And the canopies look comfy! OMG! Frick is too cute! Can I order him/her? Frick was a handsome guy wasn't he. A perfect gentleman too. I did say it in past tense, Frick crossed over but a hour ago. :(..
GPF - no they can not be tossed about. Tipped forward and backwards yes, but that's it. And now Frick as well. I'm so terribly sorry WS. I know it hurts you. I wish I had words. Rest well sweet beautiful boy. Oh, WindeSpirit, I'm so sorry you lost him. I am so sorry to hear that WindeSpirit. Rest in peace Frick. I'm sorry WindeSpirit. 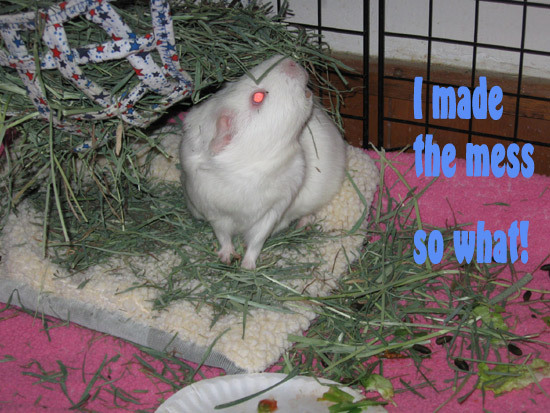 He was such a handsome piggy, and obviously very happy by the smile on his face in that last picture. I am so sorry you lost him. RIP sweet Frick! Oh no! So sorry Windespirit. Oh no, I always liked little Frick, with his handsome eyebrows. I'm so very sorry. I am so sorry to hear abour Frick. Sad. I appreciate everyones condolences. It's just hard to know what to say right now. I redesigned the cages and put the 2 together so Snow might find some comfort with Flora (her mom) and T-Patch, but she wants more to be alone right now or come snuggle with me or Vins. At least with the cage being 2x8 she has plenty of space to hide away for a bit.